It is not as PSTricks does it, but it sort of does the right thing. The spacing between dashes is always expanded using this method and never shrunk, so can get quite big with small distances. If on + off > distance - on then nothing is done. Also, it is necessary in this case to set the bounding box of the picture manually as recent versions of PGF expand the picture to include half the line width of each drawn path. This can be done using \useasboundingbox or more simply (as suggested by both Paul Gaborit and percusse) using the keys trim left and trim right). A slightly more general approach (to be used inside a tikzpicture) employs a to path, which doesn't require knowing the sub-path length in advance but again only works with straight lines. It is unfortunately a lot more involved as some work has to be done, firstly because references to nodes without anchors (e.g., \draw (A) -- (B);) require extra calculations to get the point on the border, and secondly because to paths are constructed (sort of) separately and then brought into the main picture. % Have to do this here. Although I don't think decorations will provide sufficient accuracy in all cases, following the suggestions of Qrrbrbirlbel and Jake, the following seems to work. Note, that the cheating dash is applied as a preaction. This is because the decoration uses \pgfsetdash and this lasts until the end of the current scope (i.e., beyond the end of the path it is applied); preactions are applied within a separate scope but options such as color and line width must be passed to the preaction using the cheating dash key. Actually, here's another definition of the cheating dash style which hacks into the decoration code without actually creating a decoration. It is used in the same way as the previous code. Based on the excellent answer of from @Mark Wibrow, here is a slightly different solution. It increases not only the distance between the dashes, but stretches (shrinking or expanding) the entire pattern by a factor. IMHO that's the way PSTricks does it. 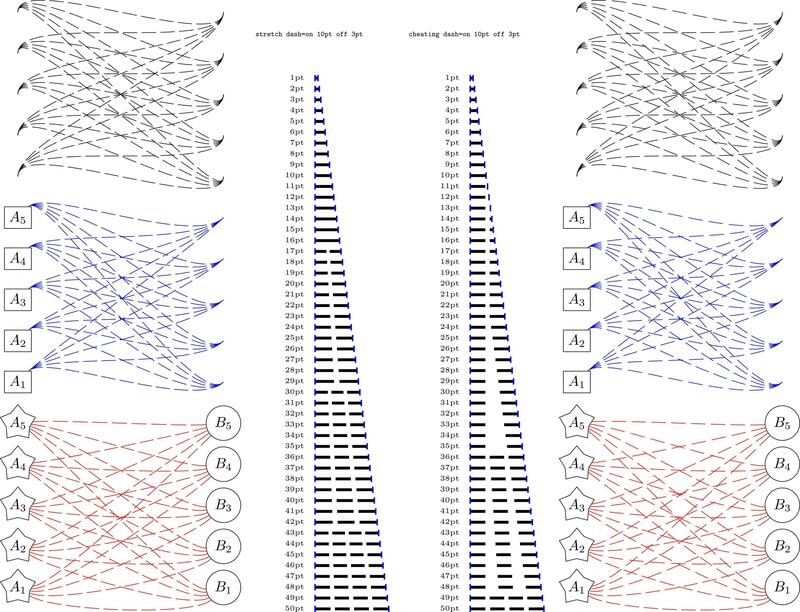 For comparison, the result for the presented solution (stretch dash) is shown on the left side of the image, on the right side is the proposed solution of Mark (cheating dash). Not the answer you're looking for? Browse other questions tagged tikz-pgf pstricks pst-node or ask your own question. How to modify pattern of dashed line to not start/end with a space? TikZ: double line, one dashed? 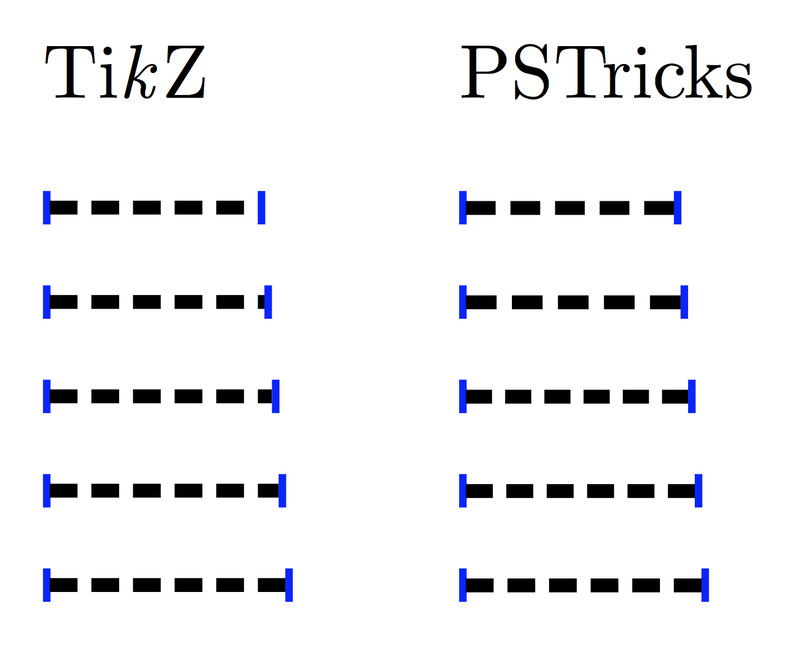 Can TikZ emulate PSTricks' inline \Rnodes, scattered along a complex equation? graphe with tikz or pstricks? How can I get lines to join up using PSTricks?